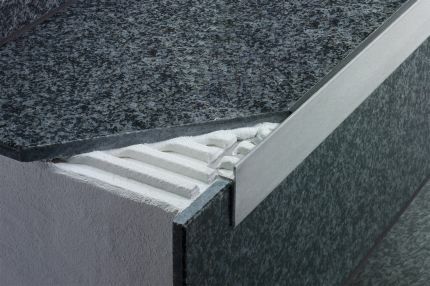 Schluter®-TREP-G and TREP-GK are designed to protect tiled stair edges and provide an easily visible, slip-resistant wear surface for a durable, safe and visually appealing stair-nosing design. TREP-GK is subsequently bonded to existing applications (i.e. as a repair). 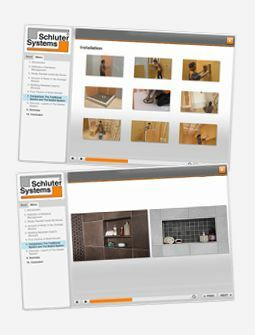 Schluter®-TREP-G is designed to protect tiled stair edges and provide an easily visible, slip-resistant wear surface for durable, safe, and visually appealing stair-nosing design. 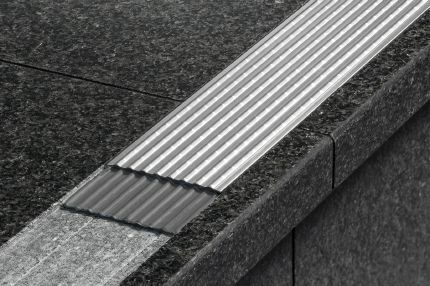 The profile is made of attractive and durable stainless steel with a special slip-resistant tread, making it particularly suited for areas subjected to heavy foot traffic, such as offices or public buildings. 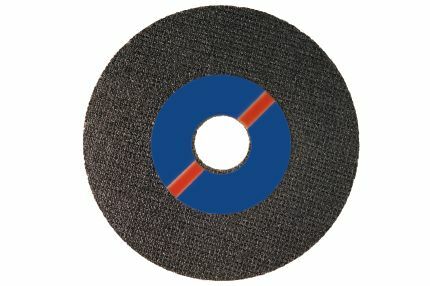 The surface features a self-adhesive, slip-resistant tread with an embedded mineral grain coating. The treads are available in a variety of colors and can be replaced in case of damage or wear. 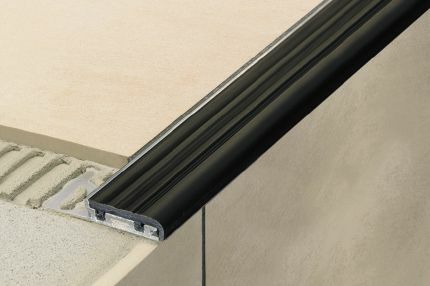 The profile can be integrated into stairs covered with ceramic tile or natural stone, as well as into a screed or surface coating. 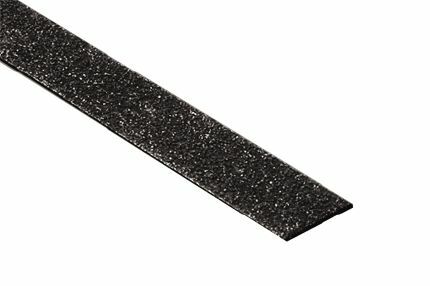 TREP-G is available in 1-3/16" (30 mm) and 2-5/32" (55 mm) widths. 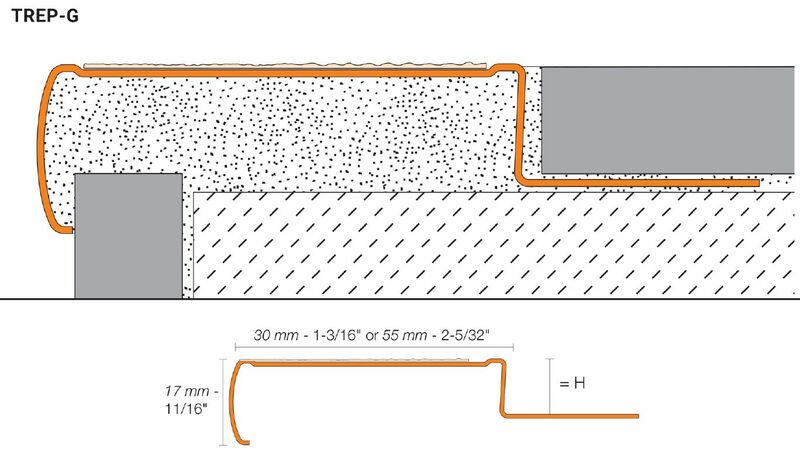 Schluter®-TREP-GK is a variant of the profile without an anchoring leg. 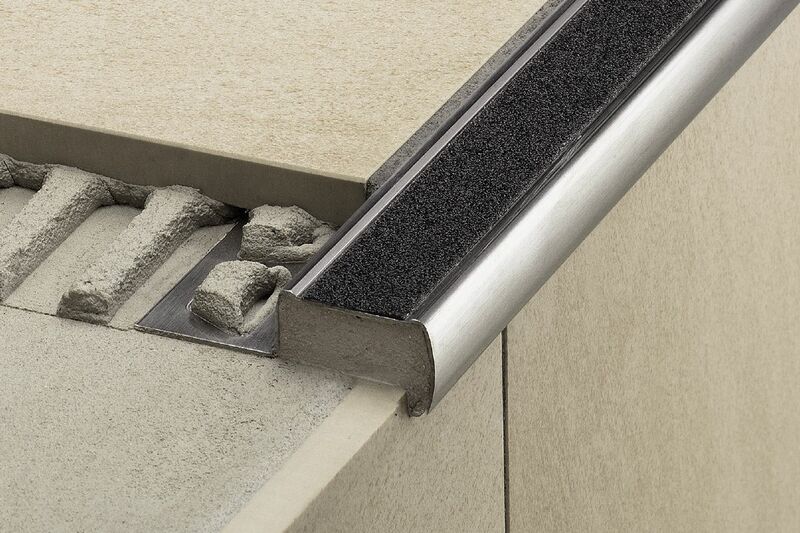 TREP-GK is adhered to existing steps, e.g., for retrofitting over damaged edges, eliminating the need to replace the entire step. 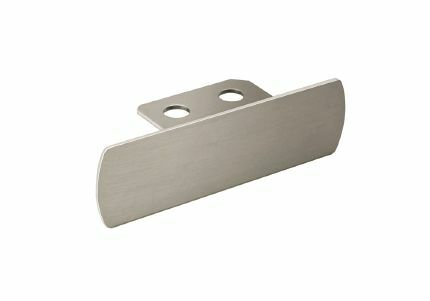 TREP-GK is available in 1-11/32" (34 mm) and 2-21/64" (59 mm) widths. Matching end caps are available. 1. Select the profile according to the tile thickness and format. 2. 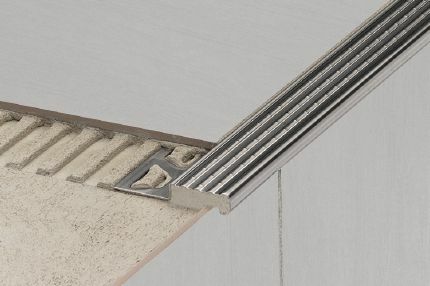 Install riser tile flush with the stair tread surface. 3. Using a notched trowel, apply thin-set mortar along edge area above riser. 4. Fill the cavity on the underside of the profile with the thin-set mortar. 5. 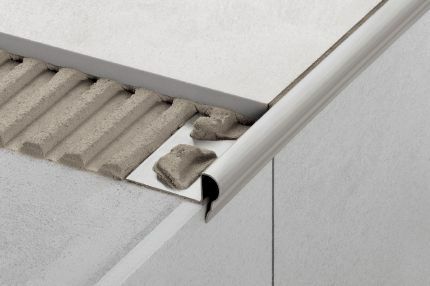 Press the trapezoid-perforated anchoring leg of the profile into the thin-set mortar, making sure the front edge of the profile overlaps the riser tile. Full coverage must be obtained at the edge area to ensure support of the profile. 6. Trowel additional thin-set mortar over the anchoring leg and the stair tread surface to ensure full coverage and support of the tile edges. 7. Solidly embed the tiles so that the tiled surface is flush with the top of the profile. 8. A joint of approx. 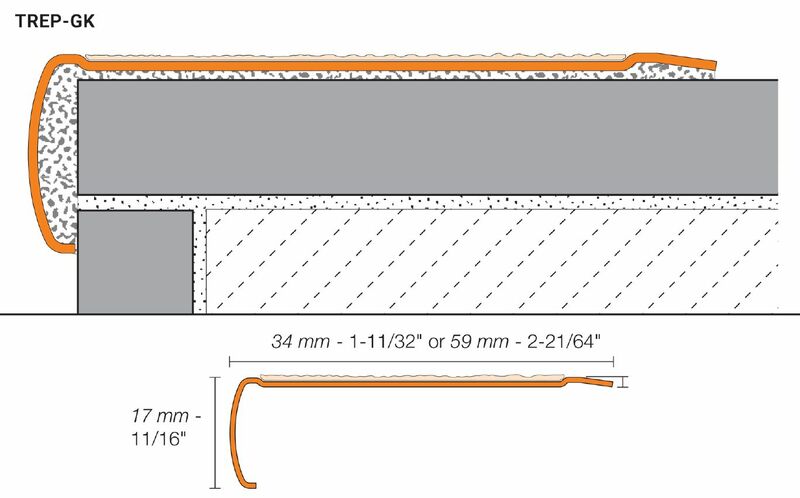 1/16" - 1/8" (1.5 - 3 mm) should be left between the tile and the profile. 9. Fill the joint completely with grout or setting material. 1. 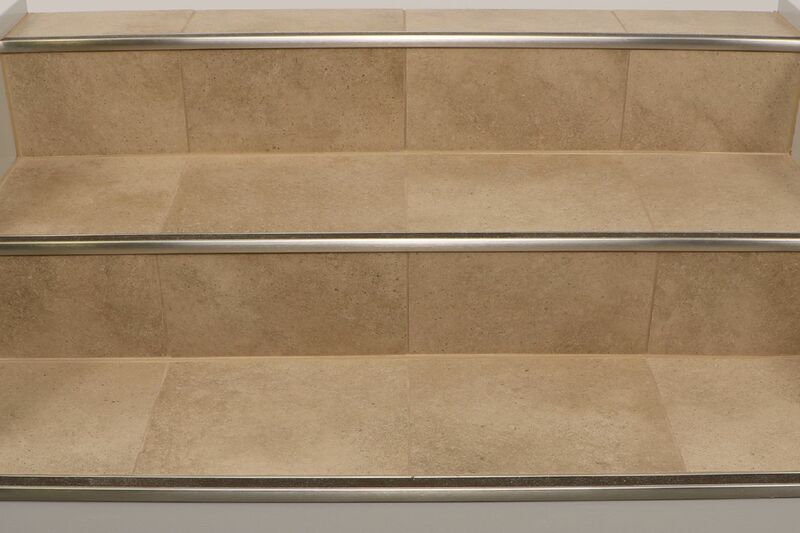 Clean the stair nosings and repair damaged areas if applicable. 2. Clean or degrease the underside of the profile. 3. Adhere the profile by fully embedding it into a suitable adhesive (e.g., epoxy resin or KERDI-FIX, depending on the substrate). 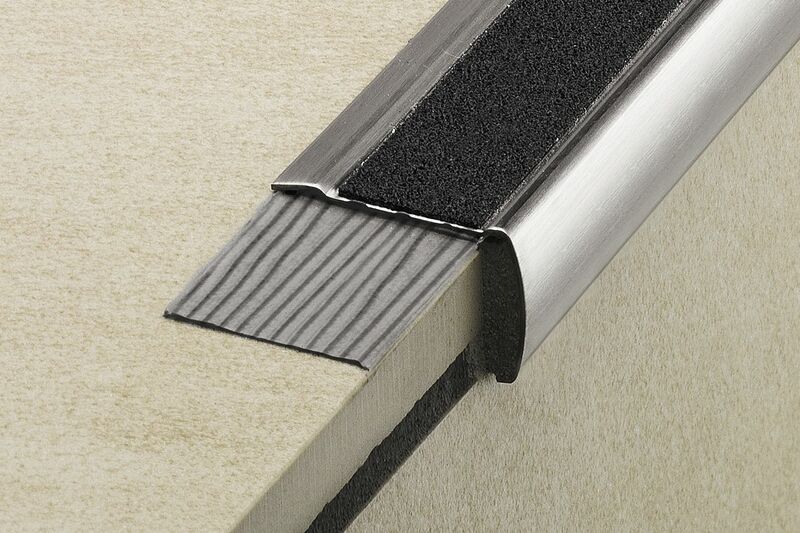 Note: The upper profile edge of TREP-GK is approximately 1/16" (1.5 mm) higher than the stair covering. 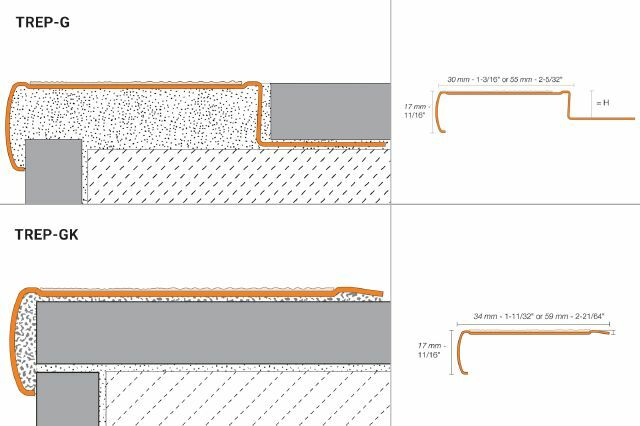 Schluter®-TREP-G stair-nosing profile requires no special maintenance or care and is resistant to mold and fungi. Clean profiles using common household cleaning agents. Stainless steel surfaces exposed to the environment or aggressive substances should be cleaned periodically using a mild household cleaner. Regular cleaning maintains the neat appearance of stainless steel and reduces the risk of corrosion. All cleaning agents must be free of hydrochloric and hydrofluoric acid and chlorides. Stainless steel surfaces develop a sheen when treated with a chrome-polishing agent.